According to a recent study, fine particulate matter (PM2.5) air pollution is associated with an 11.5 to 23.5 percent increased number of deaths in Fairbanks, Alaska. The higher end of the range applies to areas with higher PM2.5 concentrations, such as North Pole, Alaska. 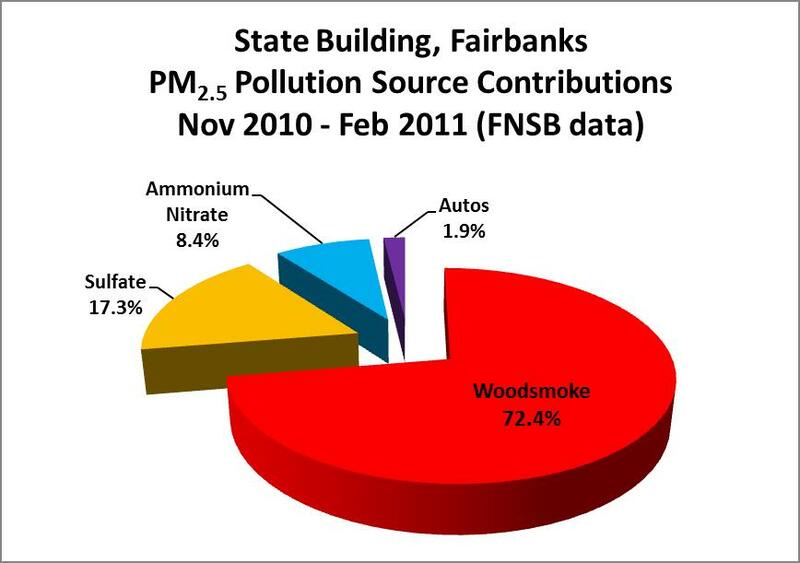 Each year, an estimated 50 to 101 deaths in the Fairbanks North Star Borough are associated with PM2.5 air pollution. Reducing ambient PM2.5 concentrations and ambient exposure would prevent these premature deaths. This study is the first to associate PM2.5 with increased mortalities for the Fairbanks area. A follow-up request for EPA to meet its responsibility under the federal Clean Air Act was submitted today to EPA Administrator Gina McCarthy. The request was signed by 153 organizations and individuals. The follow-up request states, “We need action now to combat the severity and frequency of exceedances, hazard to health, and pattern of agency disregard.” Documentation included in the letter supports the request. The follow-up letter reiterated an earlier request that EPA issue a finding on the state’s failure to submit a plan for Fairbanks to meet federal PM2.5 standards. 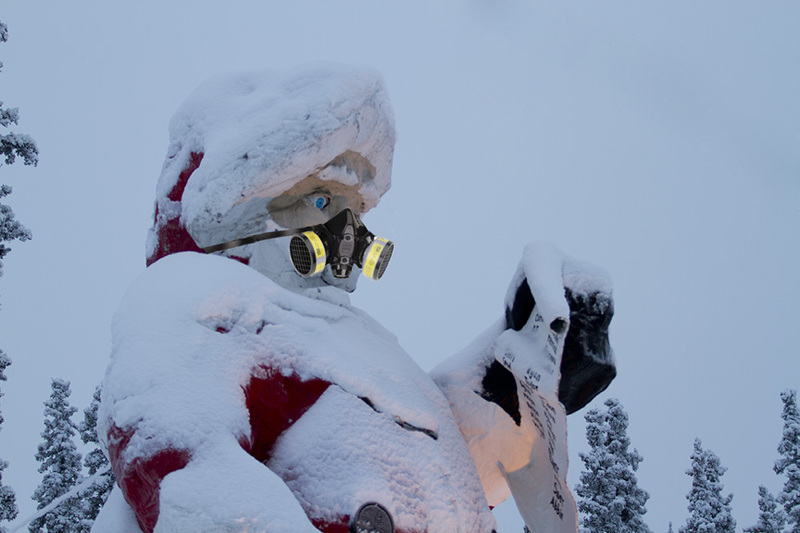 Under the Clean Air Act, when a state has not filed its plan, EPA is required to put the state on a schedule to reduce air pollution in Fairbanks and North Pole with consequences after 18 months. Santa Clause is gasping for your vote! 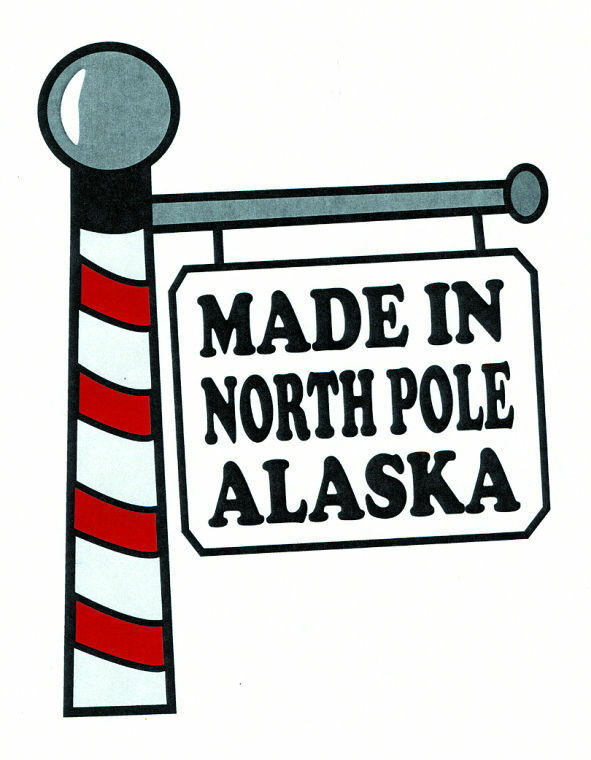 Or, do you prefer the logo submitted by the Mayor of North Pole Bryce Ward? Twenty newly released sworn affidavits reveal chilling evidence of injuries and harm attributed to two wood-fired hydronic heaters across the street from Woodriver Elementary School. Affidavits were submitted by agencies, representatives of the school, teachers, other school staff, and neighbors. These public records were released by the clerk of the court, (907)452-9277. The Woodriver affidavits are a window into the horror and dismay of residents under this drawn-out assault on their lives, health, and children as bureaucratic disregard and anti-regulation ideology from the state’s highest levels of government failed to act. The following Clean Air Fairbanks report applies the evidence from the Woodriver case to advocate for victims of hydronic heaters and hold those responsible accountable for their injuries. State v. Straughn, case number 4FA-13-01205CI, was filed in Superior Court January 3, 2013. The civil case led to a preliminary injunction order February 4, 2013 that found Andrew and Gloria Straughn’s two wood-fired hydronic heaters located across the street from Woodriver Elementary School caused a “public nuisance” and ordered their operation to cease. Woodriver Elementary School is located in the Fairbanks neighborhood of University West. 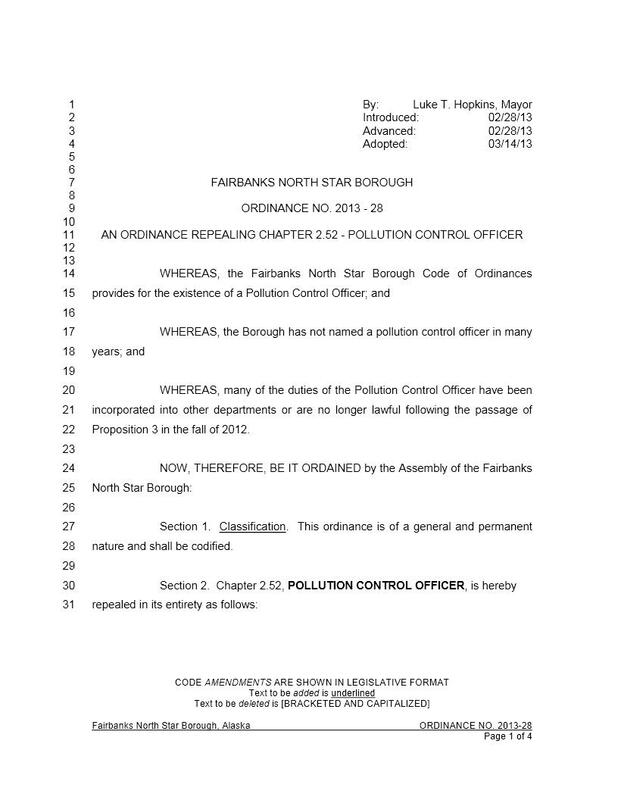 This historic case is the first and only enforcement action the state has taken to reduce fine particulate pollution in Fairbanks North Star Borough, and the only action raised against a hydronic heater in Alaska. The twenty affidavits now in public court records document grave harms including multiple asthma attacks in children, reduced lung function, eye irritation, chronic steroid treatment, chronic infections, surgeries, and hospitalizations. One affiant reports being reduced to 20% lung function. Local news reports another affiant died of a stroke. Dr Hamade’s affidavit references a 2010 study by Rachel Kossover, MPH, RD, with the Division of Public Health Epidemiology Section on the association between PM 2.5 and Fairbanks hospital admissions. 5,718 hospital visits were analyzed. The mean 24-hour PM 2.5 level was 20.1 μg/m3. The study revealed that each 10 μg/m3 increase in PM 2.5 concentrations resulted in a 7% increased risk for stroke-related hospital visit for people under age 65; a 6% increased risk for stroke-related hospital visit for people 65 years or older; and a 6% increased risk for a respiratory illness-related hospital visit for people under age 65. The state delayed enforcement for 4½ years as it mustered up the will, while the evidence of injury mounted. Installed and first operated in the fall of 2008, the boilers received their first complaints at that time. Residents made every effort to stop the smoke and reduce the harm: requests to the owners; 358 complaints to agencies (42% identify the boilers as the source); public hearing testimony; protests; backing seemingly responsive candidates; and appealing to voters with the citizens’ initiative Proposition 2 in October 2011 by Healthy Air Now for Prop 2. Other efforts included agency communications with the owners, dozens of DEC Air Quality Advisories, a Borough offer to remove the boilers for $7,500 each, and installation of a school air filtration system in February 2011. (Woodriver’s air filtration system cost about $67,500, according to the affidavit of Principal Grant Guy.) Over the years, State Representative Tammie Wilson (R-North Pole) encouraged the owners to take steps to reduce the smoke. The owners tried taller chimneys, split wood, and free installation of two $2,395 ClearStak CS-100 electric retrofit afterburners in December 2010. Nothing worked. Reports of the smoke continued until February 14, 2013, when the owners finally ceased operation of the hydronic heaters in compliance with the preliminary injunction order. In 2009, the populated area of the Borough was designated in PM 2.5 nonattainment, the only area in Alaska so designated under the Federal Clean Air Act. To meet federal standards, the state was required to file a State Implementation Plan (SIP) by December 14, 2012. The plan is now over 160 days overdue. The state’s failure to submit a SIP risks federal sanctions including loss of highway funds and requirements that will force higher electric rates. Alaska statutes do not allow citations or tickets for air pollution. Thus, the state’s only enforcement option is to take violators to court one-by-one, at substantial expense and delay. On October 6, 2012, local voters approved the citizens’ initiative Proposition 3. The Assembly used the Prop 3 initiative as a referendum to repeal all authority for air pollution control, including the ability to cite or ticket violators. A portion of the proposed Elbesan (sic) Acres school site should work well for a new elementary school. The remaining dedicated property could conceivably serve as a secondary school site if one is needed in the future. To oppose Elbasan Acres, Jeanne Olson, DVM, appealed the plan in February. On May 30, the FNSB Planning Commission denied the appeal, 5 to 2. Dr Olson has until June 3 to file an appeal in Superior Court. Contact her to offer support: Jeanne Olson <corvi@mosquitonet.com> (907)488-8800. The example of Elbasan Acres shows the Borough’s continuing disregard for any responsibility to protect public health or provide safe schools for our children. The Woodriver case teaches us we cannot passively wait for agencies to step forward to solve the epidemic of harm from hydronic heaters. Evidence of injuries is now in court evidence. Evidence of the lack of effective alternatives to enforcement is now in court evidence. Causing permanent injury to innocent victims, in reckless endangerment of our health and safety with knowledge that death or serious harm will result, is criminal and should be prosecuted as such. Saving money is not a defense, but motive. Civil liability for the injuries and lack of responsible and timely action by responsible parties weigh heavily on owners, the school district, FNSB, and the state. It is time insurers recognize the risk of carrying policies on properties with hydronic heaters. It is time to apply pressure with strategic focus to force government to stop protecting polluters of the air we need to breathe and to take responsible action to prevent the harm. The worsening plague of smoke pollution in Fairbanks and North Pole has led to a rash of news stories in the The Los Angeles Times, Reuters, Time, NPR Science Friday – text and audio, Alaska Dispatch, and KTUU, and repeated coverage in the Anchorage Daily News, AP Wire, APRN, KUAC, and the Fairbanks Daily News-Miner. It took 5 1/2 months to get it all done. They did it by messy chops and wacks, not like ripping off a Band-aid®. There was a lot to repeal before they got around to rooting out the last life and safety safeguard from air pollution secured in one of the oldest sections of code, overlooked until the very end. The mayor asked the Assembly to finish the task of wiping away the last local defense against air pollution. Quite simply, the Assembly complied. Without or publicity, on Thursday, March 14, the Assembly voted 7 to 1 to eliminate the pollution control officer position, Ordinance 2013-28. A single assembly member refused to go along. Send her a message of your thanks: Kathryn Dodge <kdodge@fnsb.us>. Tell her how much the pollution harms you: 479-8103 home. If only all Assembly members took their responsibilities seriously and researched their options and the consequences, instead of merely following instructions and mouthing ineffectual postmortem regrets. Civics 101: Assembly members control their own vote; there can be no mandate on how that vote must be cast. What would have happened if the Assembly refused to remove code established to protect life and safety? What would happen if they voted to reestablish air quality protections in code? These are serious questions with vital consequences for public health. Honestly, what outcome could be more excruciating than perpetual Borough hand-wringing while air pollution damages more residents’ lives? Assembly Member Dodge followed the Constitution and stood up for your life and safety. Others didn’t. The Borough attorney should have refused to approve Proposition 3 as an initiative or as a referendum consistent with state law and the Alaska Constitution. When Prop 3 as code conflicted with other code providing air quality safeguards, the Borough attorney and the mayor should have explained the range of choices and the consequences for the Assembly, not instructed the Assembly on how they must cast their vote. The Assembly made little effort to seek additional information, including that they were throwing away the only air pollution authority in the Borough with “police-like” power — the power to issue citations or tickets to violators. Assembly member Dodge’s action on Prop 3 proves the Assembly had a lifeline and dropped it. Proposition A in 2011 followed the same sequence, failures, and lonely hero. It was Assembly member Diane Hutchison in 2011 who cast the solitary vote to retain safeguards prohibiting woodsmoke over 50% opacity and heavy plumes of smoke crossing property lines per Mayor Hopkin’s ordinance, 2011-03. How the Borough dumped YOUR air quality protections. Prop 3 was put forward by the sponsors as an initiative, and improperly approved by the Borough Clerk under the advice of Borough Attorney Rene Broker. [Mistake #1.] Then, after registered voter signatures qualified it for the ballot, it was submitted to the voters for approval. [A mistake in judgment perhaps, but each voter controls his or her choice as does the Assembly.] Voters narrowly approved the measure October 2, 2012, and it was added to code (FNSB 8.21.025). Instead, the Assembly could have chosen to find Prop 3 “unenforceable” and in conflict with existing code. Prop 3 made the bed, let Prop 3 sleep in it! In a classic demonstration of “groupthink,” The Assembly followed misguided direction and joined the wrecking crew. “The people may propose and enact laws by the initiative, and approve or reject acts of the legislature by the referendum.” Constitution 11.1. Public health and safety are too essential to be legislated away by popular vote — that’s what constitutional delegates decided in 1956. Representative Tammie Wilson may not agree, but she’s never claimed to be a constitutional scholar. Once Prop 3 was enacted into code, it conflicted with existing code it could not repeal. That brings us to the choice the Assembly should have been offered: acknowledge Prop 3 as “unenforceable” as a matter of law. Instead, without understanding this choice, the Assembly used their own statutory authority to reject laws that protect health and safety, an authority which is theirs alone. There’s nothing illegal about the Assembly throwing out health and safety protections. Irresponsible and cruel? Yes. However, any premise that Prop 3 forced their hand to vote is incorrect. Representative Wilson claims the Borough’s lack of police powers prevent it from enforcing air quality control. This is wishful thinking, ignorance, or a blatant effort to mislead. As anyone who has had their dog picked up by animal control knows, the borough is fully capable of issuing citations and fines. FNSB code of ordinance clearly states that the borough has full authority to “enforce an ordinance and to prescribe a penalty for violation of an ordinance,” 1.02.020 A.7. as backed up by state law AS 29.35.010(7). Alaska DEC, however, lacks similar citation authority in state law. Both DEC inspectors and the State Troopers are authorized to enforce air quality controls under 46.03.890, but state law has never granted DEC or the Troopers authority to issue air quality citations or tickets. State air quality controls can be enforced only thru taking violators to court one-by-one under AS 46.03.790 or AS 46.03.810 and AS 12.55.035. Agreed, these statutes contain severe penalties, but the slow and costly process judicial process limits the efficacy of this method and thus its overall deterrent effect. DEC, and now the FNSB, lack citation authority. Big mistake if you support effective enforcement of air quality protections for the purpose of protecting public health and heading off the economic penalties of nonattainment stipulated in the Clean Air Act. The Borough’s systematical repeal of air quality codes breaks the 2010 MOU with DEC, that specifies the Borough will “take the lead” on “local control programs”. Clearly, the current Borough air quality program “fails to meet the terms of the cooperative agreement” in breach of AS 46.14.410. It is past time for DEC to notice that the Fairbanks MOU is due for a major overhaul and hold a hearing as required by AS 46.14.410. More importantly, wiping away local air quality safeguards enforceable through citations abandons the health of residents and visitors to Alaska DEC. Without statutory authority to issue tickets, DEC is unable to adequately enforce the state’s limited set of air quality rules and prevent harm from air pollution. The Assembly paid no attention to their unique authority to issue citations and just dumped this local power along with every other safeguard to protect you and your children from air pollution. How could the Assembly not notice this gaping void in DEC’s paltry enforcement toolbox? Did the Assembly not examine how well does Alaska DEC perform its job of protecting public health from air pollution? “Clean air is essential to every breathing moment” proclaims DEC’s air quality homepage. When faced with a real public health crisis, however, DEC track record of inaction protects the polluter and prolongs the harm. What’s it take to get DEC to take a flagrant air pollution violator to court? In the only example, 2 wood-fired hydronic heaters owned by a landlord across from the Woodriver Elementary, it took the combined weight of approximately 366 complaints from 50 to 90 individuals including principals and school nurses and the passage of 4 1/2 years to bring DEC to file in court. 17 became state witnesses and turned over personal medical records to the court to document the destruction of their bodies from the smoke. It gives DEC too much credit to call their response disinterested or incompetent. Ideologically biased or criminally negligent adverbs come to mind. When the evidence is broken bodies, waiting for too much evidence is not a good thing. Did DEC somehow lose this authority in the brief history of this young state? More likely, the state legislature never opened its eyes to pollution serious enough to cause permanent bodily harm and even death. Levels of air pollution known to increase hospitalizations and deaths are categorized as a nuisance like a barking dog or littering, and are misunderstood as too insignificant to warrant a stepped up enforcement capability. Court rooms are not the place to stop public health crimes in progress. In the Woodriver case, Judge Robert B. Downes took 32 days to determine the boilers were a “public nuisance” and order them to cease burning. By various reports, the landlord kept burning for as long as 8 more days before finally stopping. To effectively prevent harm to health and meet EPA attainment, the key is enforcement, not voluntary measures or buckets of excuses. In Juneau, local staff issue tickets to air pollution violators. The enforcement program works both for individual compliance and deterrence. Juneau was declared PM 10 nonattainment in 1990, and last exceeded the standard in 1993. Enviable, indeed “exemplary” according to DEC. Serving as a desirable model; representing the best of its kind. Characteristic of its kind or illustrating a general rule. The Assembly reaped, now the people weep. Local code now gives more protection to floodways [no joke: enforced with $500 fines! ], than to public health from air pollution. This in a community where, according to agency scientists, “Fairbanks has some of the highest wintertime ambient PM2.5 concentrations measured throughout the United States.” No plan is in place to replace discarded protections. The Legislature is not considering any request from DEC to grant citation authority. Residents continue to be victimized by neighbors’ polluting choices. Some will blame Mayor Hopkins, Attorney Broker, and the Assembly. Excepting Assembly member Dodge, we do. But don’t put this on the children. Approximately 25,300 residents under the age of 18 live in the borough, according to the US Census. Children can’t move away, can’t choose where they attend school or daycare, can’t choose how their home is heated, can’t select where their foster family lives, can’t even take themselves to a doctor. Adults are empowered to make these and other decisions that set the course for every child’s future. What parent would give away the ability to protect his or her child’s future? What adult would throw themselves at the mercy of a disinterested, negligent government based over 700 miles away that can’t even ticket air pollution violators? What leader would wring his hands and ask for our understanding, while ignoring the constitution and state laws that empower him to protect public health? Assembly member Kathryn Dodge, please accept our sincere appreciation for refusing to go along with this injustice against our children and their futures. Your courageous vote shows the way forward to a serious reexamination of what went wrong and how the Assembly retains every lawful authority to make it right. Thank you. “Not only will we have to repent for the sins of bad people; but we also will have to repent for the appalling silence of good people.” ― Martin Luther King, Jr.
Woodsmoke hogs the pie (chart). Pie being the total PM 2.5 pollution source contributions, as collected on nearly 300 24-hour filters from four sites in the Fairbanks North Star Borough. Don’t be fooled by deceptive arguments that distract attention from the primary winter source. The filters don’t lie. The only way to significantly reduce PM 2.5 smoke pollution is to tackle woodsmoke at its source. The study acknowledged the need for further examination to more accurately determine source contributions. Specifically, the study did not sample levoglucosan (chemical marker of wood smoke), dibenzothiophene and benzo naphtho thiophene (markers of diesel vehicles and residential oil combustion), or picene (marker for coal combustion). The study failed to acknowledge a need to sample acrolein, formaldehyde, benzene, and polycyclic aromatic hydrocarbons (including benzo[a]pyrene and dibenzo[a,h]anthracene] — EPA-listed hazardous air pollutants released during wood combustion. [For a more complete list of the toxic chemicals in wood smoke, visit.] Alaska DEC highlights the harm to health from three of these air toxics in a fact sheet on wildfires. 60 to over 80 percent of this area’s “spectacular nonattainment” under federal air quality law comes from wood burning. 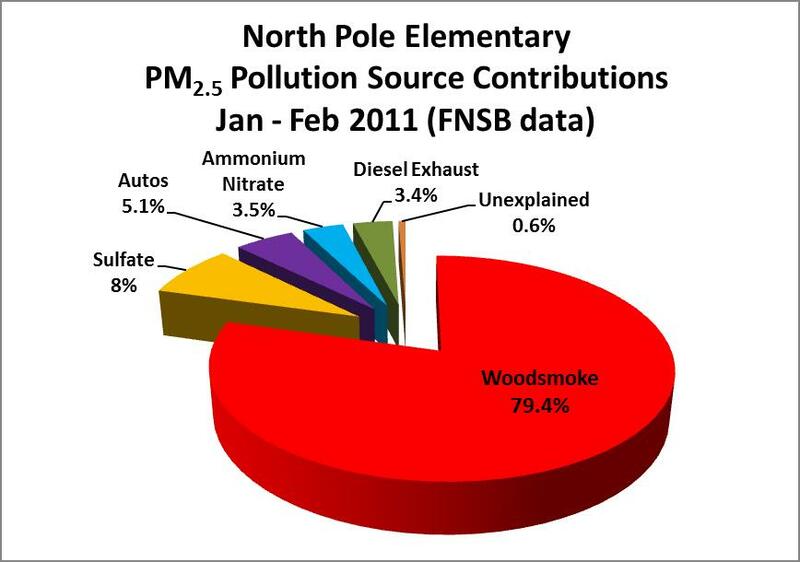 Wouldn’t you think someone would want to sample Fairbanks and North Pole for air toxics? In another unacknowledged limitation of the study, source contributions on nonattainment days were not examined separately from attainment days. Out of nearly 300 filter samples, only 73 were from days in excess of the 24-hour PM 2.5 National Ambient Air Quality Standard of 35 μg/m3. Samples from the seriously polluted 2012/2013 winter would provide ample nonattainment days to examine. Understanding our nonattainment air is essential to figuring out how to meet attainment and protect public health. The CMB modeling revealed woodsmoke (likely residential wood combustion) was the major source of PM2.5 throughout the winter in Fairbanks, contributing between 62.7 and 81.2% of the measured PM2.5 at four sites. The other sources of PM2.5 identified by the CMB model were secondary sulfate (7.8–20%), ammonium nitrate (2.5–10.5%), diesel exhaust (not detected-9.6%), and automobiles (not detected-6.8%).